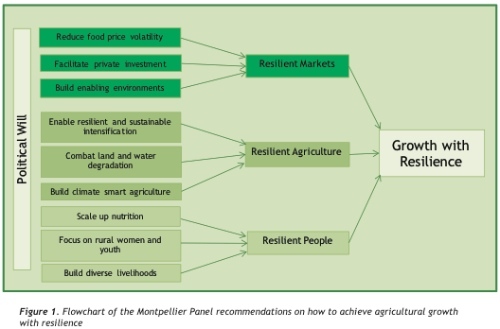 The Montpellier Panel, a group of experts from the fields of agriculture, sustainable development, trade, policy, and global development chaired by Gordon Conway from UK’s Imperial College, have a new report ‘Growth with Resilience: Opportunities in African Agriculture’. The report looks at how agriculture is connected to economic growth, food production, climate change and ecosystem services, but interestingly puts resilience at the centre of their approach. They argue that that while there are many challenges to agriculture in Africa, there are an under appreciated set of opportunities. The figure below summarizes their report’s strategy. An excellent example is Ghana, where agricultural gross domestic product has risen by five per cent each year for the past decade and the millennium development goal of halving hunger by 2015 has already been achieved.This was largely due to the leadership of former president John Kufuor who gave agricultural development a high priority and created an enabling environment for the adoption of new technologies and other innovations. Two PhD positions at the Stockholm Resilience Centre. Applications are due May 2nd. The positons are with a project Governance of ecosystem services under scenarios of change in southern and eastern Africa, funded by the Swedish International Development Agency (SIDA). To address the question How may ecosystem assessments be best designed and applied for poverty alleviation? One student will focus mainly on mapping and modelling of ecosystem services drawing on methodologies from the natural and systems sciences, while the other will focus primarily on governance of ecosystem services drawing more strongly on methodologies from the social sciences. Both students will work on case studies in the Eastern Cape and/or Western Cape regions of South Africa , as well as in Madagascar, depending on their interests and skills. We envisage that the two students will work together closely to share experiences and insights, and advance novel social-ecological understanding of the case studies and methods for assessing and managing ecosystem services. The students will need to spend at least 6 months/year in Stockholm the first two years and part of the year during the remaining period. There are currently a limited range of approaches available to measure, quantify, assess and display data on ecosystem services. Many of these approaches are quite data intensive in their requirements and to date have not been applied in the management of African ecosystems and services. This project aims to develop new methods for assessing multiple ecosystem services which can be applied in data poor situations. In particular, this project aims to understand how the “bundle” of ecosystem services associated with a particular social-ecological system may change under different future scenarios. We envisage paying particular attention to the potential for “regime shifts” — large, persistent changes in social-ecological systems and their trajectories of development (e.g., rangeland degradation, or the shift from subsistence to commercial farming). Such shifts can have large impacts on ecosystem services and human well-being, and the data collected in this study will be incorporated into the developing global Regime Shifts Database. The student will be supervised by Dr. Reinette (Oonsie) Biggs (Stockholm Resilience Centre,Sweden ), Dr. Belinda Reyers (CSIR,South Africa ) and Prof. Thomas Elmqvist (Stockholm Resilience Centre, Sweden). How do bundles of ecosystem services co-vary with local livelihood strategies, ecological knowledge, and social organization? A combination of qualitative and quantitative social science methods and spatial tools such as participatory GIS will be used to identify and map how local ecosystem management, land use, and institutional structures across scales interact with and respond to the dynamics of multiple ecosystem services. In particular, the project will focus on implications for amplifying or moderating the potential for so called regime shifts, i.e. large persistent changes in ecosystem services. The project will also assess barriers and bridges for improved governance of multiple ecosystem services at local and regional scales that allows for sustainable poverty alleviation in Southern Africa. The student will be supervised by Dr. Maria Tengö and Prof. Thomas Elmqvist (Dept of Systems Ecology & Stockholm Resilience Centre). 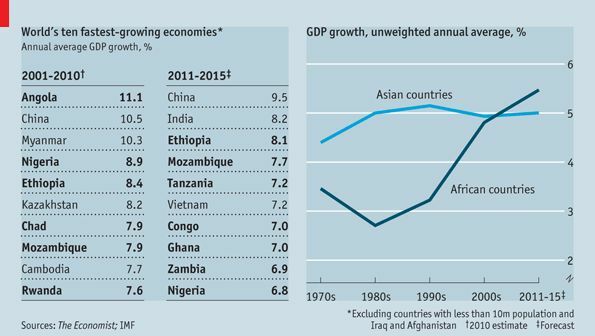 While China’s economy continues to rapidly grow, during the first decade of the 2000s, most of the world’s fastest-growing economies were in sub-Saharan Africa and the IMF projects that this trend will continue over the next five years. Africa’s changing fortunes have largely been driven by China’s surging demand for raw materials and higher commodity prices, but other factors have also counted. Africa has benefited from big inflows of foreign direct investment, especially from China, as well as foreign aid and debt relief. Urbanisation and rising incomes have fuelled faster growth in domestic demand. Economic management has improved, too. Government revenues have been bolstered in recent years by high commodity prices and rapid growth. But instead of going on a spending spree as in the past some governments, such as Tanzania’s and Mozambique’s, have put money aside, cushioning their economies in the recession. Some ambled through the decade rather than sprinted. Africa’s biggest economy by far, South Africa, is one of its laggards: it posted average annual growth of only 3.5% over the past decade. Indeed, it may be overtaken in size by Nigeria within ten to 15 years if Nigeria’s bold banking reforms are extended to the power and the oil industries. But the big challenge for all mineral exporters will be providing jobs for a population expected to grow by 50% between 2010 and 2030. Commodity-driven growth does not generate many jobs; and commodity prices could fall. So governments need to diversify their economies. There are some glimmers. Countries such as Uganda and Kenya that do not depend on mineral exports are also growing faster than before, partly because they have increased manufacturing exports. Standard Chartered thinks that Africa could become a significant manufacturing centre. The Bill & Melinda Gates Foundation, the wealthiest private foundation in the world, joined the Consultative Group on International Agricultural Research (CGIAR) in December 2009. CGIAR is funds a set of research groups – IWMI, CIFOR, etc – that do a big chunk of the research and development for developing world agriculture. For the last few years they have been experiencing problems with defining their goals, funding, and operation style. The Gates foundation has just recently made developing world agriculture one of its priority areas, and is investing large amounts of money. A recent article on SciDev.net ask people what the Gates Foundation involvement in CGIAR will mean for Africa in Are Gates and CGIAR a good mix for Africa? The critics say that the tensions between those who favour a science- and technology-driven approach to increasing agricultural productivity, and others … who prefer to think in terms of promoting broader agricultural innovation systems, are at their acutest when it comes to genetically modified food. They point out that [Prabu] Pingali now answers to a new boss, Sam Dryden, who has just been appointed director of agricultural development, and who worked for Monsanto in 2005 when the agricultural firm bought the seed company for which he worked. They claim this is evidence that Gates will be opening the door for the extensive use of GM crops in Africa and elsewhere, and say that this illustrates the flawed “magic bullet” approach to improving agricultural productivity. But the Gates Foundation does not see things the same way. “From the beginning we designed a strategy that looked across the entire value chain,” says Pingali, who himself came to the foundation after working for many years in the CGIAR system.That chain includes market infrastructure and the policy environment that helps farmers improve productivity. “We provide a very large amount of support for the policy environment that is needed to kick-start agriculture growth in Africa,” says Pingali. He points, for example, to the Alliance for a Green Revolution in Africa (AGRA), headed by former UN secretary general, Kofi Annan, which has received US$15 million from the Gates Foundation to influence broad aspects of agriculture policy in several African countries. “But we also realised early in our own work that we cannot do everything, [which is why] we focused on the productivity improvement side,” says Pingali. This in turn is the reason that the foundation has been funding plant breeding and crop improvement activities for rice and wheat and maize, and more recently has begun to fund research into other crops that are important in Africa, such as millet, sorghum and cassava.For these reasons, some believe the Gates Foundation is better working within the CGIAR system rather than outside it, pulling scientists from CGIAR centres into its sphere of influence. Finally, some argue that Gates’s; involvement should improve dialogue with beneficiary countries. “The CGIAR agenda is supposed to be demand-led, involving regional and national organisations, and that must involve the needs of the poor, and not just the research interests of the advanced countries,” said George Rothschild, Chair of the European Forum for Agricultural Research for Development (EFARD) and a former head of IRRI. Whichever way the partnership between the Gates Foundation and CGIAR plays out, Gates’s engagement with the group has already sent a strong signal to other donors, namely that agricultural research is of global importance, and that only a huge investment will help ensure that such research makes an adequate contribution to combatting hunger. But how much it will succeed in meeting Gates’s ambition of eliminating hunger across much of Africa and the developing world, and how much it will in doing so boost the profits of large agricultural companies at the expense of small farmers and rural communities — as critics fear — remains to be seen. How much is African poverty really falling? Martin Ravallion, Director of the Development Research Group of the World Bank,responds to Maxim Pinkovskiy and Xavier Sala-i-Martin’s NBER paper that estimates a decline in African poverty. He agrees that poverty is decreasing, but believes they are overstating their case. We must first be clear about what we mean when we say “poverty is falling”. What many people mean is falling numbers of poor. However, PSiM [Pinkovskiy & Sala-i-Martin] refer solely to the poverty rate—the percentage of people who are poor. (There is no mention of this important distinction in their paper.) And it is not falling over their whole period of their analysis, which goes back to 1970. Rather they find that the poverty rate has been falling since the mid-1990s. 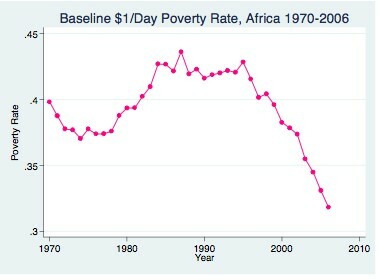 Here we agree: aggregate poverty rates have fallen in Sub-Saharan Africa (SSA) since the mid-1990s. Shahoua Chen and I came to exactly the same conclusion in our research, for the World Bank’s global poverty monitoring effort, although our methods differ considerably and (no surprise) I prefer our methods. Two points to note here: (i) Chen and I show that the poverty decline in SSA tends to be larger for lower poverty lines (in the region $1-$2.50 a day) and (ii) PSiM’s method attributes the entire difference between GDP and household consumption to the current consumption of households, and they assume that its distribution is the same as in the surveys. These assumptions are very unlikely to hold, and they give an overly optimistic picture. In effect, PSiM are using a lower poverty line than us. … Another important difference is that Chen and I are more cautious about the data limitations. There are not enough good household surveys available yet to be confident that this is a robust new trend of a falling poverty rate for SSA. PSiM are not so restrained, as is plain from their title! …Hopefully we will see a confirmation of the emerging downward trend for Africa in the years ahead, as more (genuine) data emerge. A new NBER working paper African Poverty is Falling…Much Faster than You Think! from economists Xavier Sala-i-Martin and Maxim Pinkovskiy argues that African poverty has been rapidly falling across Africa since 1995. They use methods they use to look at global income distributions to show that recent economic growth has reduced rather than enhanced Africa’s huge levels of inequality. The New York Times Magazine has an article by Andrew Rice Is There Such a Thing as Agro-Imperialism? on new mega-investments in agricultural land in Africa. For more see Food Crisis and the Global Land Gra which is a website run by GRAIN an NGO supporting small-scale farmers. Prof. Adams Bodomo is a Ghanaian linguist at the University of Hong Kong and one of the first scholars to write in English about the African community in Hong Kong and Guangzhou. … As Bodomo and other scholars see it, immigration, like other byproducts of prosperity, is an unfamiliar issue in China. 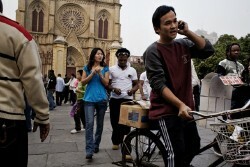 For most of its history, China was so poor that hardly anyone but missionaries or marauders wanted to stay. China’s posture toward foreigners was erratic; it oscillated between the xenophobia that produced the Great Wall to the zealous overture of the Beijing Olympics. But China is still ambivalent about people settling down permanently, and Bodomo sees that as a the big question about whether these communities survive. There is also a podcast interview with Osnos. Fish is now the most traded animal commodity on the planet, with about 100 million tons of wild and farmed fish sold each year. Europe has suddenly become the world’s largest market for fish, worth more than 14 billion euros, or about $22 billion a year. Europe’s appetite has grown as its native fish stocks have shrunk so that Europe now needs to import 60 percent of fish sold in the region, according to the European Union. In Europe, the imbalance between supply and demand has led to a thriving illegal trade. Some 50 percent of the fish sold in the European Union originates in developing nations, and much of it is laundered like contraband, caught and shipped illegally beyond the limits of government quotas or treaties. The smuggling operation is well financed and sophisticated, carried out by large-scale mechanized fishing fleets able to sweep up more fish than ever, chasing threatened stocks from ocean to ocean.